Apple Taste (アップルテイスト, Appuru Teisuto) is a doujin album by pikapika released on 2014-02-02 (Dai-Kyuu-Shuu Touhousai 9). It features vocal arrangements of themes from Lotus Land Story, Perfect Cherry Blossom, Phantasmagoria of Flower View and Undefined Fantastic Object. A new wind of pop blows through this album. The guitar sounds different to how it usually does in AZITAMATEISHOKU's works, but the arrangement was done by the man himself. Each track is about Merry dreaming of Gensokyo. While she continues to sleep, Renko visits her. ↑ Track 03.コイイロアリス was originally featured under the name 恋色アリス on the album 恋色アリス released in 2013. 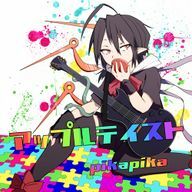 ↑ アップルテイスト lyrics and comments posted on pikapika's website. アップルテイスト • ワールド・エンド・ファナティック • ブルーアワーにとけたゆめ • ツインドライブ!! This page was last edited on 4 February 2018, at 06:10.